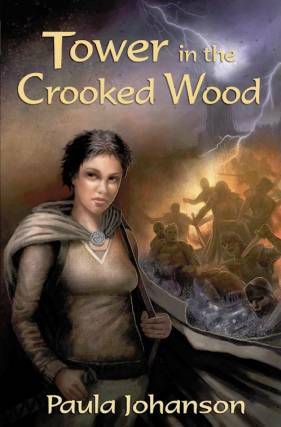 Tower in the Crooked Wood is an oddly compelling read. No car chases, no massed armies of Orcs attacking the citadel, no spaceships crashing into suns, and yet I found it a difficult story to put down. It's not as if each chapter ends with a cliff-hanger; but I would nevertheless find myself continuing on to the next page just to, you know, finish the thought. And certainly not to read all of the rest of the next chapter. But somehow... suddenly it's four chapters later, and I still haven't put the book away. The story is a deceptively simple one of community and resistance: a woman walks across the continent to track down a sorcerer who nightly enslaves random victims, magically transporting them to various work camps to help build his sorcerer's tower. Whenever Jenia, our heroine, is taken, she finds small ways to attempt to sabotage the sorcerer's efforts. In between magical abductions, she walks on, encountering communities so isolated and self-contained that they appear blissfully unaware of the sorcerer setting up shop in the neighbouring wood. Although the Sorcerer's abductions provide the central threat, this isn't your typical swords and sorcery adventure. Most of the novel takes place in the tiny fishing village -- really more of a camp then a village -- that is Jenia's last stop before entering the crooked wood. It is her immersion in the foreign culture of the fishers, contrasted with her previous encounter with a village in the interior, and with her own longingly-remembered community, that is the main focus of the novel. This is a novel about meeting and being accepted by strangers, of learning the ways of another culture, of persevering in the face of distractions and loss, and of retaining one's core identity under adverse circumstances. More anthropology than high fantasy, it reads like a cross between Elenore Smith Bowen's (highly recommend) anthropological novel Return to Laughter and say, Schindler's List; with maybe a touch of Johnny Appleseed thrown in for good measure (our heroine is an arbourist). If that combination sounds a little odd, it's because this is a refreshingly different fantasy: philosophical, without being pompous or talkie; deeply ethical without being judgmental; respectful of other cultures without being simplistically relativistic. I especially appreciated that Jenia isn't always right, and doesn't always 'get' that the people around her aren't being slow or malicious; they're simply pursuing their own goals according to the norms of their own cultures. Just because they haven't taken up arms against the Sorcerer doesn't mean they aren't resisting, perhaps much more effectively than Jenia herself. 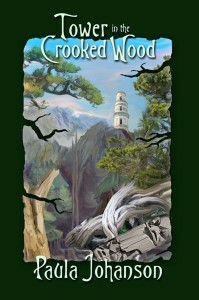 If there's a central theme to Tower in the Crooked Wood, it's an examination of the individual's role within community. On the one hand, Johanson seems to suggest that it only takes a momentary lapse in the individual's commitment to community to leave one vulnerable to the mental confusion and external direction that's at the core of the sorcerer's control over the abductees. On the other hand, Johanson equally clearly delineates that some demands are illegitimate and may be vigorously resisted, as when Jenia refuses to tend the dying orchard of a village that won't take 'no' for an answer. The deeper questions of whether outsiders should be offered membership; the fate of those who fail to make the cut; and above all the reciprocal obligations of various strata within a community, are all explored within the framework of the various cultural perspectives Jenia encounters. Indeed, it is the Sorcerer's refusal to provide his momentary slaves with even food or drink - as opposed to merely owning slaves, a common enough practice among the fishers - that constitutes the core of his "crimes against community". Tower in the Crooked Wood is a great example of Canadian SF. It resonates precisely because the heroism here isn't about climatic battle or sorcerous pyrotechnics, but the tiny day to day acts that define who we are as individuals and as a community. The book's publication by Bundoran Press reflects both the publisher's excellent tastes (their track record for bringing intriguing new voices to print makes one wish they offered a subscription option) and Canadian origins, but the novel ultimately demands a universal audience.